Available in chrome or brushed nickel, this kitchen sink faucet is perfect for any kitchen. The pull-out sprayer makes this kitchen faucet convenient and easy to clean with. The single lever allows for easy one-handed operation of this faucet. Are you looking for a kitchen faucet in Barbados that is both stylish and functional? If so, the CAE Single Lever Kitchen Faucet with Pull-out Spray is a great option. Take the hard work out of doing the dishes with the oh-so-convenient pull-out sprayer. 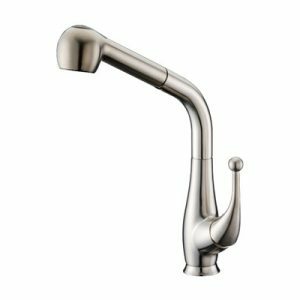 This kitchen sink faucet is available in either brushed nickel or chrome, so no matter the style or design of your kitchen, this faucet will make a beautiful addition.